I hate when pop culture vultures call my peers and me “the Nintendo Generation.” Yes, we grew up playing the Nintendo Entertainment System (NES) and probably know more about the Triforce than any religion we were raised in, but that’s not all we are. If that were so, Video Power would have been a fondly remembered classic as opposed to being a footnote. Any American kid growing up in the 1980s and early 1990s knew what the NES was. So it made sense that children’s television magnate Haim Saban would want to get in on the trend – hence the birth of Video Power. 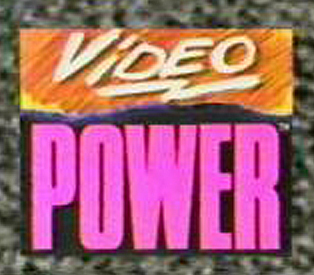 Premiering in 1990 in first-run syndication, Video Power started as a tips and tricks show hosted by a hyperactive teenager named Johnny Arcade. The show also had an animated segment featuring The Power Team. This was a group made up of Acclaim characters like the cop from NARC, an Arch Rivals character, the guy from Wizards & Warriors, the Bigfoot monster truck and Kwirk the tomato. The unrelated videogame characters as cartoon superhero team may seem familiar to you. It’s the formula of Captain N: The Game Master. Who would you rather watch – the cop from NARC and Bigfoot fight an inept crime boss, or Mega Man and Simon Belmont versus Mother Brain? Case closed. So, the producers of Video Power needed to do something about their format. The 1991 season was shot at New York’s legendary Kaufman Astoria Studios. Video Power shared the building with The Cosby Show, Glengarry Glen Ross and Woody Allen’s Shadows and Fog. None of their genius rubbed off on Johnny Arcade and company, though. The producers revamped the show for its second season. Video Power became a kids’ game show, where contestants would answer NES trivia questions, play a new NES game head-to-head (i.e., Teenage Mutant Ninja Turtles II: The Arcade Game, Mega Man 3 and Bases Loaded II) and the winner would run through a Velcro prize maze. The maze looked like something from Hell’s version of Double Dare, with redecorated cubicles and two giant tubes at the end. I’m surprised no kid ever broke a limb running through it. The maze was packed to the gills with NES and Sega Genesis games, and contestants would don a Velcro vest and helmet so they could hold onto as many games as possible. While most of the titles were probably filler, kids seemed to win some solid videogames like Bases Loaded, Insector X and Battletoads. The series lasted one more year. With the birth of Super Nintendo, Video Power was facing an obsolete prize wall and low ratings, and Johnny Arcade and company had to move on. Stivi Paskoski, the actor who played Johnny Arcade, guest starred on Law & Order and Law & Order: Criminal Intent several times, as well as other shows like Damages and New Amsterdam. Play-by-play commentator Terry Lee Torok went on to announce the 2010 Classic Tetris World Championship. Steve Treccase, former keyboardist on Remote Control, graduated to the house band leader on Video Power. He also lugged the Neo Geo machines to lucky contestants. He has gone on to work in music and sound departments on different films. Video Power is a time capsule from when videogames became a viable form of home entertainment. If it taught us anything, it’s that the technology moved fast, faster than a television game show format. While this series is a footnote in videogame history, it does show how far the industry has come. Ian will haphazardly stumble upon pop culture footnotes while writing. Sometimes they appear here and sometimes he tweets them via @IanGonzales.